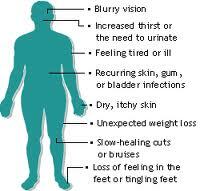 Diabetes type 1 and 2 is the most common endocrine disorder encountered in clinical practice. Diabetes type 1 and 2 is a condition where there is inadequate insulin in the body for the patient’s metabolic needs. Metabolism is a term that describes the means by which the body handles the variety of nutrients taken in from a dietary source. Fats, proteins, and sugars are absorbed and transported to the liver for initial processing. In that organ, these nutrients are either stored, broken down, shipped out for use by other organs or changed in some way to meet later nutritional needs. This factory-like process is controlled by the availability of the nutrients and by the hormones bathing the liver, including insulin, glucagon, and epinephrine. In addition, these hormones have effects on the manner in which distant organs, such as muscle tissue and fat tissue, handle the available nutrients.An inadequacy of insulin can come about for at least two important reasons.